From the author of the Edgar Award–winning The Wessex Papers comes a hilariously offbeat novel about Henry “Hen” Birnbaum, a teenage boy who dreams of becoming a rock star despite a minor setback, namely: his girlfriend just dumped him and kicked him out of their band. Now his social life consists of night after night of VH1 marathons with his best friend and next-door neighbor, the neurotic Emma Wood. Then there’s the matter of Sarah, his sister, who mysteriously disappeared for a whole year and just as mysteriously returned. As the story unfolds, the reasons for her disappearance seem more unbelievable than Henry ever could have imagined. Maybe rock god status isn’t too farfetched for Henry. After all, crazier things have happened. Goodreads. Review - I am a shallow being. I freely admit to be as such as I purchased this book based on the title, cover art and the fact that it was authored by a man. Turns out that my puerile ways resulted in a great read told from a teen male perspective and a new (much needed) male YA author in my arsenal - not a bad day's work. 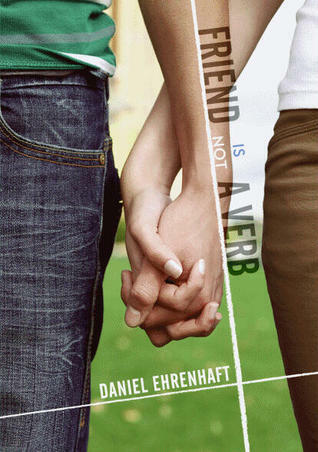 There are so many things to like about Ehrenhaft's exploration of a teen romance gone kaput, a friendship strained and a sister at a distance. Introspective, sensitive and quirky - the reader is taken on a journey where the character gradually shifts in his consciousness which affect his choices in turn. The voice of the character is so relatable and authentic that it is frighteningly easy to share his mind. He's sullen, oblivious, quick witted and slovenly - sometimes all in the same passage. The author really captured the contemporary teen male voice without playing to cliches or this female's perception of what a guy sounds like. While many readers might gravitate to the romantic or friendship aspects of the novel, I found myself captured by the brother-sister dynamic presented. As an older sister the push and pull of Sarah and Hen's relationship really rang true to me. Boys aren't as outward in their feelings as their female counterparts and this is shown to great affect with the impact Sarah's disappearance (and return) have upon Hen. To the outside world he doesn't care - but that's anything but the truth. This segues nicely into Hen's bass playing and Gabe's impact on his musicality and growth as a son, brother and friend. It's quiet and beautifully realised. Teen girls are crazy and it was quite amusing to see them at work from the laid back perspective of our protagonist. Whether it was the selfish manoeuvrings of Petra, Emily's personality 180 or Sarah's deliberate quash on enlightening Hen with any information whatsoever it is fun to see what rolled off his back and how much truly resonated. It is here that I had some concerns, at times the depiction of some of the secondary characters was a little light but never falling into caricature territory. The central problem of Sarah's disappearance is handled well in retrospect but when reading it felt a little anti-climatic. There is also a sub plot involving dogs that felt extraneous but I could also argue that most things you do during the summer are immaterial. The voice is fun...even when mocking Journey and the pudgy kid from Dawson's Creek (oh no you didn't mock my Pacey). It moves quickly with Hen envisioning his life retold as part of the now defunct MTV Behind the Scenes. Ehrenhaft smoothly navigates the many intermingling subplots and Hen's growing awareness with humour, perceptiveness and some catchy dialogue. A contemporary tale about a guy, his bass, the girl next door, his self-absorbed ex and his MIA sister that has its hand on its heart, crotch and funny bone. Huh, this sounds like something I'm in the mood for right now. I'm one of those types you mentioned that gravitates toward the romantic relationship but I must confess that I'm mighty curious to find out what happened to the sister and just where in the heck did she disappear to? I've already added this to my list so I shall have to pick it up. Thanks for putting this on my radar, it sounds great! Wow, that sounds really great and like the kind of book I feel like reading. I love it when books have covers that make me want them :-). Love the sound of this. I've been meaning to open it up! I've so been wanting to read this forever! I just need to find a copy of it. Have you read Tell It To Naomi? It's another great book by the same author. I'll have to pick this one up. I loved Tell it to Naomi so I'm sure I'll love this one too. Thanks for the review! Thanks for the review. I will be picking this up very soon. I do have a request, if at all possible. Can you go back to your old page layout? This new one isn't working too well. This sounds really good, it's going on my list of books to check out soon. This sounds like a great find. I, too, am a sucker for a great cover. That's not shallow, no, not at all. Plus, I love when music plays an element in stories. This definitely will be added to my always growing TBR list.